The Hangover is an American comedy of 2009 about 4 best friends who decide to visit Las Vegas for having a bachelor party two days before the wedding of one of them. A lot of crazy adventures happen to them as they wake up in the morning and do not remember anything they did the night before. One scene of this film is devoted to blackjack: the one of friends reads some blackjack book about card counting strategy (it was described also in such films as 21 and Rain Man) and decides to try it in casinos for winning some money. All friends do not support this idea because "It is not interesting to gamble if you already know that you will win". Four best friends - Alan, Stu, Doug and Phil - take a decision to visit Las Vegas: Doug has a wedding in two days, so, guys have a plan to organize a great bachelor party for him! They rent a room in the Caesar's Palace and everything is going to be fabulous: friends drink for Doug's future family life and talk about their plans for the future. But the most interesting things happen on the next morningâ€¦. And now their main task is to find Doug (because he has his wedding tomorrow), refresh their minds about everything that happened yesterday, find the mother of that small baby and try to explain Doug's fiancÃ©e why her future husband is not at home yet! 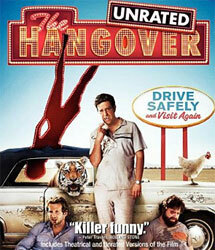 Awards: The Hangover had won 3 nominations. The movie had 18 more nominations.